Terryberry's 360 Recognition Platform is one hub with everything you need for effective employee recognition in your organization. Discover what makes Terryberry’s 360 Recognition Platform so effective. With 360 Recognition, all recognition is hosted on one easy-to-use platform. This makes recognition experiences more engaging and meaningful for recipients, plus programs are easier to manage and monitor. Take a tour of the platform with this video. 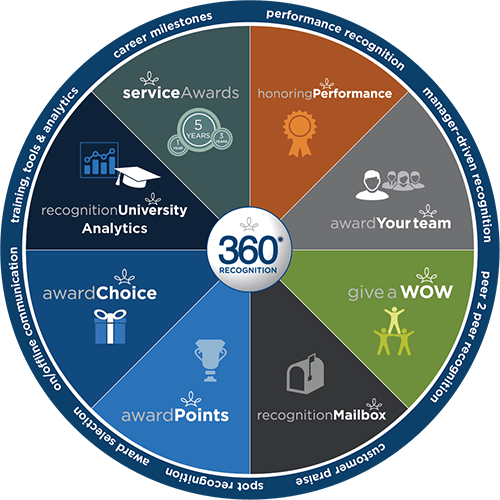 Ready to increase the efficiency, consistency, and impact of your recognition program overall with 360 Recognition? 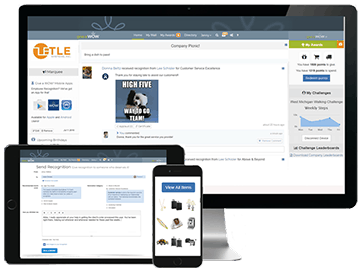 A single hub houses all of your recognition initiatives and corporate awards from one easy-to-manage platform. Recognition programs work together. Unlike stand-alone programs, 360 Recognition modules interact for better performance. Service awards, peer recognition, and performance-based incentives share visibility for optimal recognition. 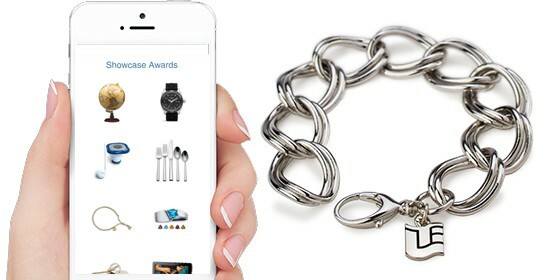 Easy-to-use and interactive interface makes giving and receiving recognition fun and meaningful. Support your culture of formal, informal, and day-to-day recognition. Powerful reports help you easily spot rising stars and assess engagement within individuals, departments, and your organization as a whole. And so much more…choose ways to recognize employees now, and enjoy the flexibility to easily add features and modules as your needs change over time. We’ll handle all the details of your program behind the scenes, so you can focus on what’s important to you…your people and their achievements. When you partner with Terryberry, we’ll help you get started with a new employee recognition solution, or breathe new life into your program. Terryberry offers a host of solutions for a great employee rewards and recognition program that is easy to manage, whether you have 50 employees or 50,000. 25,000+ clients trust Terryberry with their rewards and recognition programs. Enlist the help of Terryberry in developing a service awards program to honor your dedicated and devoted employees. We’re waiting to hear from you.